I love the concept of lifestreaming. Initially I used Tumblr, but then specific web apps started to turn up and I checked them all out and kept coming back to FeedFriend. With the release today of the latest update to twhirl, the popular twitter client now owned by seesmic; my decision to use FeedFriend was consolidated. It took a while to work out that the latest iteration of twhirl now incorporates FeedFriend. So now, once set up you get a window just like the twitter one but in it is the feed from FeedFriend. You can see everything that your friends are doing, blog posts, tweets and everything else that they have added to their FeedFriend account right in Twhirl! Although I rave about the virtues of RSS this is different. FeedFriend summarizes all my friends social networking and blogging activities in one place. Not only do I see updates as they happen, but it is content that I would follow more closely if I could. Now I can. I am interested in what they have to say but as you know my RSS reader can look like a train wreck at times and I miss things. Now I don’t have to. But it doesn’t just stop at being able to see what they are doing but I can also comment on them as well. The comments go to FeedFriend and not the place where they were posted though. This might mean on average fewer page views over time. But I do have to read the post and that you have to go to the post to do. Video however is displayed on FeedFriend. So I am more likely to comment in FeedFriend. 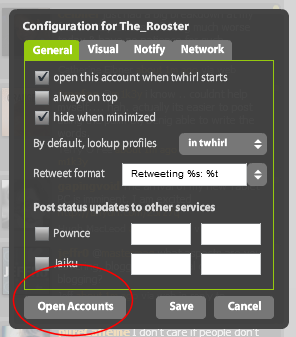 Which is also part of the functionality of the new FeedFriend feature in Twhirl. There is no doubt for me that this feature has changed my online life. I am going to be able to be more involved with the conversation and more inclined to do so. It has consolidated my online friends and people that I like and enjoy to watch. It makes the content more relevant. twhirl is becoming a killer app. One thing that I thought was not that clear were the instruction on how to make the magic happen. So, quick summary here. Download twhirl, you will also need to install Adobe AIR Runtime. You’ll be prompted to do so if you have not got it already. Go to settings and Click the “Open Accounts”. Here you can add your twitter accounts (and yes multiple accounts for twitter are supported). Now the cool FriendFeed stuff, use the pulldown menu to select “FriendFeed” and enter your FriendFeed user name (it is the one that appears in your URL for FeedFriend). I have noticed that the FriendFeed servers are under a bit of strain, timing out and being unavailable and other interesting errors. Maybe the timeline for FriendFeed doesn’t update as it should, like mine is tending to do. But I am sure these problems will be fixed in time. I am excited about these changes and new features. Loving it, the seesmic and twhirl teams deserve a slap on the back, thanks guys. Keep up the great work. There is a video from Loic on the new features but the instructions are not that great but listening to Loic is. Feel free to add me to FeedFriend, I think I am going to be using it more! Not a huge player of chess. But this is chess with a difference. In this version of chess you play as you would expect, but after you take your go the computer starts to calculate it’s move. Normally when this is happening you wait around, not with the Thinking Machine. Lines start to draw all over the board while the computer calculates 1000’s of possible moves and future plays. You keep playing until you loose, or at least that’s what I do. Interesting concept and makes for interesting waiting time. The pieces are not the usual representations and this makes it a little more difficult (I lost my queen because of this). I could not tell you how good a player the computer is because I am crap. I am also not sure what the transparent circles are surrounding the board while you are thinking. Still I think it is worth a look at the Thinking Machine 4 just because it does something that I have not seen before, even if you don’t play a whole game. It was a mad craze when I was a kid and the only way that I could solve the darn thing was to take it apart! In recent times I have seen the Rubiks Cube making a small comeback to frustrate people everywhere, they even have an official homepage. But we are prepared this time and we have the Internets to help us. Behold a page I found for when you are done seeing how messed up you can get your cube. It is called notably enough “The solution to the Rubiks Cube or Magic Cube“. Go, learn it and amaze your friends and indeed impress yourself. Also check out the official guide to getting it solved. I have not compared the two solutions, so they may be identical. I have no idea if it works, it took years of therapy to get over the last attempt at solving it, I am not about to try again. For some people getting that elusive screenshot can be difficult. Not only that, once you have it you then have to host it and code it into a web page or blog post. A service I found a few while back will make this job easy and quick, with some nice formatting and features as well. The service is called kwout (don’t ask me to say it). When you arrive you are presented with a blank space to input a URL of your choice and some quick straight forward instructions. The process is dead easy to clip a screenshot and have it on your blog in quick smart. Enter the URL of the site or page that you want to take a screenshot of. A new page loads. select the specific area you want clipped and hit the “cut out” button on the floating toolbar. If you want a larger version you can specify exactly or use the slider on another floating toolbar. Essentially this is scaling of the image and it actually looks good. Scaling sometimes screws with an image to the point that it looks awful, this does not seem to be the case here. From here you get presented with your cut out that you selected. You can change the border, corners and colours of the background. All this changes in real time and you get to see exactly what it will look like. Next you can select a few options regarding sharing and decide if you want to post it to Flickr or Tumblr. This is a great service in that it simplifies the process of getting a decent screenshot for a blog post or some other page that allows html. For people that can’t accomplish the rounded corners, borders and drop shadows it is a great option. Also, if you were in a flat out hurry to post something or on the road or at an internet cafe something like that and wanted a quick image or screenshot, this would do the trick and nicely. One thing that my be a potential problem is that if you used the service you are at the mercy of that service, or indeed any service upon which you were relying on for content in your pages or blog posts. If the service disappears one day then so do your images. If they decide to change the terms of service or make the service a paid one then the availability of your images might also be affected. So my advice is to use wisely and don’t bank on things never changing. Although the ability to send the image to another service like Flickr does mitigate this problem somewhat. Still a great way to get a nice fresh image that you can use anywhere. Well temporarily at least. NetDisaster gives you the opportunity to create chaos on any website on the Internets. When you arrive your greeted with few text fields to fill in. Web site URL, the type of disaster you would like to inflict there are many to choose from and include flood to “acid pee” and dinosaurs. Once the type of disaster is selected you can choose a few other options as well, like sound. Select if the process is self healing or “massive”. Then “GO”! Simple time waster, but then the best ones are simple. The page loads with the website you entered and the mayhem starts in either automatic mode or mouse control mode. You’ll notice also that there is a toolbar at the top of the page. This allows you to change the type of disaster at any time without reloading the page. This is thanks to the fact that the page is rendered in flash. Because of that it is just an image and the links etc won’t work. If you want to send the page and settings to a friend via email you can do that as well. Finally you can cancel the animations and the options and load the webpage as per usual. There are also some other options available via a pull down menu on the right hand side, it is all pretty self explanatory. Great time waster and a bit of fun. The animations are well done and as I said, simple but heaps of fun. Go ahead and wreck your site. Heck aliens attacked mine! Although I liked the flooding one as well but due to my colour scheme it was a bit lost on it. I suggest that you get to your workmates’ PC load up their current page and set to work invoking some disaster, timed right so that almost total destruction is complete on their return to their desk. I made myself a dodecahedral calendar earlier in the year and that was heaps of fun. Sad to report that my youngest son decided to see if it would withstand a foot, it didn’t. But lucky for me it is December and it is just about had it’s day in the sun. I am yet to make this years calendar as that one was hard enough. But for people that don’t want to take the time to make their own 3D calendar then the 2D version might be for you. This one is dead easy, small and unobtrusive. Care of Marlies’ Creative Universe comes a PDF which contains a strip calendar that you can print in either a horizontal or vertical format. The idea is that you can utilize the unused space on the side of monitors. Comes in Balck and white and colour. Nice idea I thought. As I said easy, no scissors or glue required. But heck if you are up to the challenge the dodecahedral is fun and rewarding. Twitter Poster, How Influential are You? There is a bit of buzz on twitter about a new site called twitter poster. The sites purpose is to visually represent the degree of influence that twitter users have. The size of the image relates to the number of followers. I guess that would mean it is better to have fewer followers and more influence, not sure. There are different editions of the site, a twitter poster (.com) but also versions for Australia and Mexico (?). I checked out the Aussie one and it turns out that I am in the poster, as well as characters like Michael Specht and Kodo. Yet Cam Reilly is on the .com. I think that the dot com might be a global poster, so I guess that is good. But Cam doesn’t rate a mention on the Aussie version. It might have something to do with your profile. If you use twitter it is pretty interesting and might get you connected with some interesting people. Yet I am not sure what gets you on the poster, I am not a heavy user of twitter yet I am there. There are obvious ones on the poster like Scoble who tweets everything. So go hard and try and get on the list, if you find out how then let me know. Diversion finished.